Cineplex Classic Film Series brings great films back to the Big Screen this fall! It is surprising that urban legends have not really been tackled on film too much. The Mothman Prophecies did a good job for that legend. Candy man is phenomenal. But aside from those two, nothing really comes to mind? There are films about urban legends that are a creation of the film itself, like The Blair Witch Project, but films based on actual urban legends seem to be rare. This month though, one of the most famous urban legends comes to our home theatre screens courtesy of director Darren Lynn Bousman, best known for Saw 2,3,4 and Repo! The Genetic Opera. Richard Vineyard (Stephen Moyer of True Blood) is taking his family on a weekend camping trip to a place called The Barrens in the pine forests of southern New Jersey. Along for the ride are Richard’s wife Cynthia (Mia Kirshner), young son Danny (Peter DaCunha) and reluctant teenage daughter Sadie (Allie MacDonald). Richard remembers camping with his father in the Barrens when he was young and wants his family to share in his fond memories. But once at the campground, Richard finds it overcrowded with obnoxious teens and loud families. In hopes of finding a more secluded campsite, Richard and his family venture deeper into the woods, but The Barrens seem to have an odd effect on Richard, causing his to go slightly mad. In addition, the frequent campfire stories of the Jersey Devil seem to be ringing true as something in the woods stalks Richard and his family. I was really impressed with The Barrens, finding it had a really retro 70s or 80s vibe to it. It harkens back to films like Race with the Devil while also echoing classic slashers like Friday the 13th. Stephen Moyer is very good as the good father going mad, taking on characteristics much like Jack Torrance in the Shining. As the plot unravels, we find out that Richard may know more about the Jersey Devil legends than he initially let on. The tension in the film builds well and the family dynamics are well played out. Bousman keeps a good pace with some nice twists and surprises and a great atmosphere that is very reminiscent of classic ‘something in the woods’ flicks. 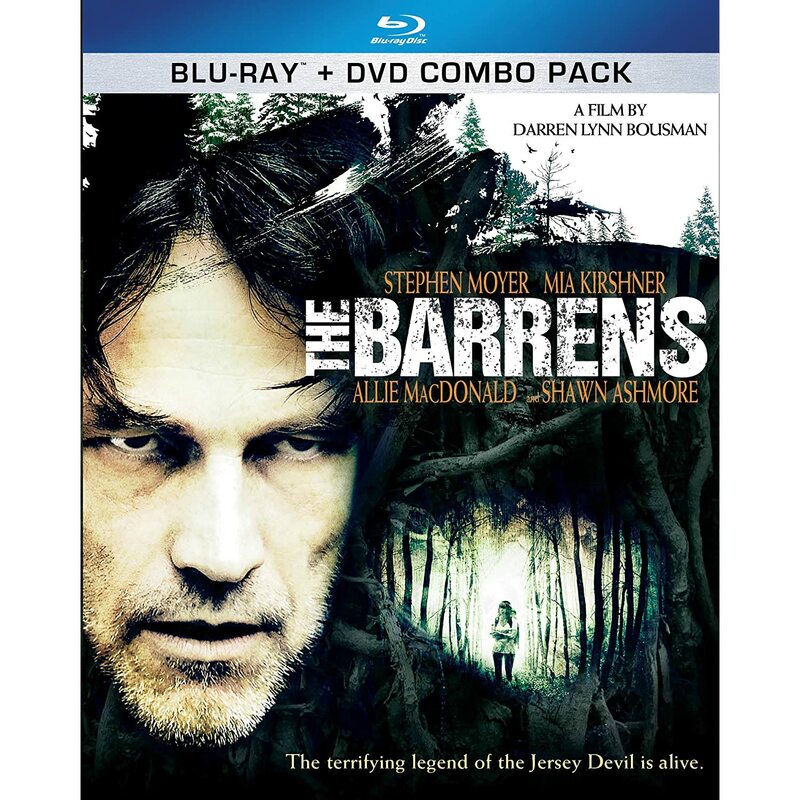 The Barrens is a fun throwback horror film with some solid performances and a great twist on the legend of the Jersey Devil. The Blu-ray from Anchor Bay is a solid hi def transfer. The majority of the film takes place in the woods, which often ends up being problematic with black levels in night scenes and flickering sun through trees during daylight, but Bousman handles it all very well with nice deep blacks and great clarity in the daylight scenes. Detail is very nice throughout and colors are nice and natural looking. A nice little gem, and Canadian at that, The Barrens is a great little suspense horror about one of the most famous urban legends ever. Definitely worth checking out. Recommended. The trailer was crappy, but the movie was fun. Kinda typical, but well done and I enjoyed it.